Select the entire bulleted list. The bullets won’t appear selected. Click Home, and then click the arrow next to Paragraph>Bullets. 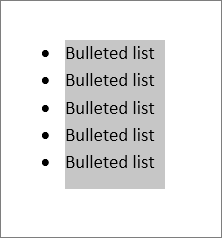 Choose another bullet style from the Recently Used Bullets list or the Bullet Library. 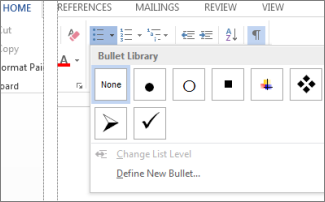 If you want to remove the bullet style, select None. 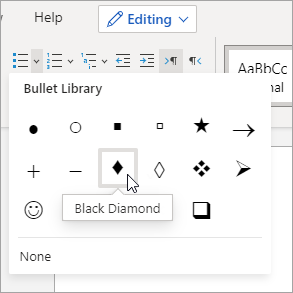 If the bullet you want isn’t in the library, click Define New Bullet, and then click Symbol, Picture, or Font to add a new bullet style to the library. Select the entire bulleted list. Choose another bullet style from the drop-down list. Vote for an idea, or share a new one in our suggestion box at word.uservoice.com.